Built on a long-standing transnational collaboration in training and research, the University of Freiburg in Germany and the University of Strasbourg in France offer an International Master programme in “Polymer Science” (IM-PolyS). In an intercultural environment, the IM-PolyS aims at providing a comprehensive and interdisciplinary training including chemical, physical and biological aspects of polymer and sotf matter sciences. Contacts with industry and early possibilities to specialize according to individual preferences will offer broad opportunities for a career in the industry or academia. 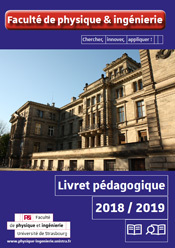 This IM-PolyS is supported by the Franco-German University (Université Franco-Allemande / Deutsch-Franzöisishe Hochschule) in the framework of its PhD-Track programme, an ambitious programme linking high-level university studies at the Master level to doctoral research.